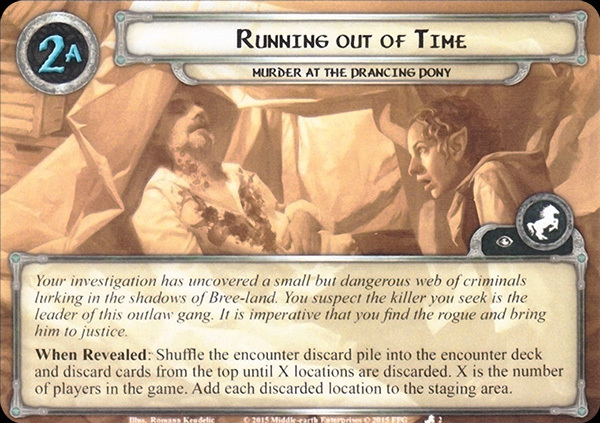 Your investigation has uncovered a small but dangerous web of criminals lurking in the shadows of Bree-land. You suspect the killer you seek is the leader of this outlaw gang. It is imperative that you find the rogue and bring him to justice. When Revealed: Shuffle the encounter discard pile into the encounter deck and discard cards from the top of the encounter deck until X locations are discarded. X is the number of players in the game. Add each discarded location to the staging area. 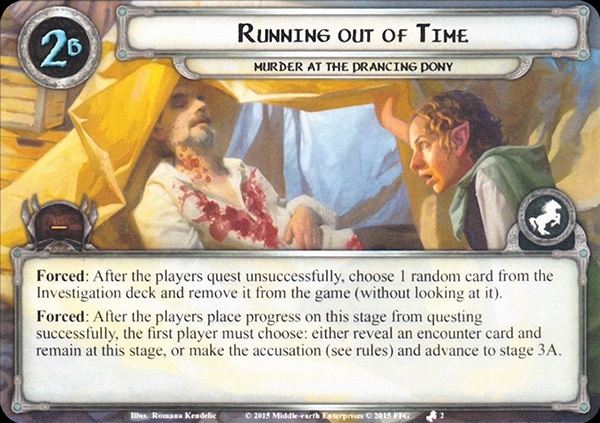 Forced: After the players quest unsuccessfully, choose 1 random card from the investigation deck and remove it from the game (without looking at it). Forced: After the players place progress on this stage from questing successfully, the first player must choose: either reveal an encounter card and remain at this stage, or make the accusation (see rules) and advance to stage 3A.